Some Google Goals can be set up with ease, while others require custom code and a web developer. However, with proper setup, goals will help you strategize your approach to marketing your website. Here are four examples of goals you should make a priority to track through Google and why these goals are important for your business. Unless your website was designed in 1982, chances are you have a Contact Us page where visitors are able to input their information, reach out to someone at your company, and expect to receive a response. Similarly, many websites also utilize landing pages to feature relevant and specific sales messaging in hopes to get users to sign up for the product or service by providing their contact details. With Google Goals, you are able to track how you acquired the contact information from people who took action on these pages. You can also create a goal to track the amount of contact page hits you receive so that you can review that against the number of submissions you generate. A bad hit to submission rate would suggest that you need to simplify your form. Simply follow step 3 and make sure the destination is just the URL for your contact page. If you have ongoing content on your website— which you should to further educate your audience and for SEO purposes— there is a good chance it is all grouped up under a similar URL structure. Most commonly, websites will use www.yourwebsite.com/blog/xyz or youwebsite.com/blog/case-study-xyz. A Google Analytics Goal set to track these URL links as a whole will help you identify how many times your content was viewed and how you acquired those individuals. For eCommerce companies, enabling eCommerce goals and tracking for analytics provides an abundance of insightful data on how an action is taken across the site. This intel includes cart abandonments, average order value, and total transactions across any time period. eCommerce is not difficult to enable for your site, but the details depend on what platform your eCommerce is hosted on. Enhanced eCommerce reporting gives you access to more insights, including funnel steps taken by users, and only requires that you have the newest version of Google Analytics installed on your website. If you are still having trouble accessing this data, custom code may need to be implemented to force the data through the system. Let &Marketing know if you are experiencing this, and we’ll be happy to help you set it up. Understand the custom code and assign values manually. Event Category: Typically the object that was interacted with (example: “video”). This is mandatory. Event Action: The type of interaction (example: “play”). This is mandatory. Google Analytics Goals provide you with information to make informed decisions on how your audience and marketing tactics engage with your site. Goals can be quickly set up and provide valuable insight for your organization’s marketing strategy. The team at &Marketing has installed all of the goals above and more, and utilize the data provided by these goals to determine where to focus our marketing efforts in order to build growth for our client partners. 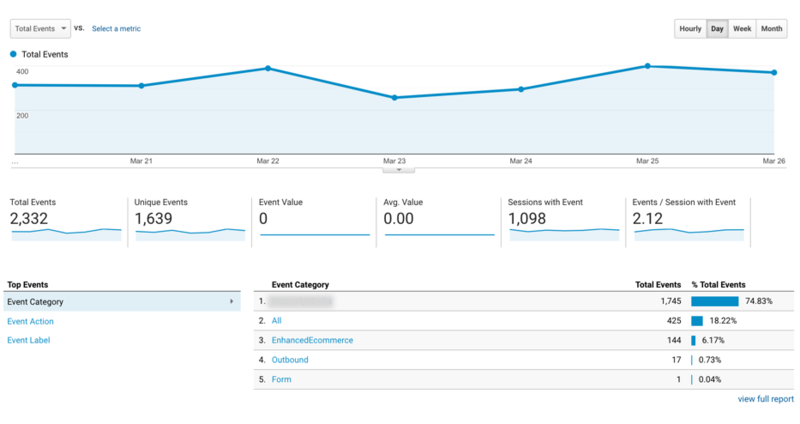 If you are looking to install Google Analytics Goals and don’t know where to start, we’re here to help! Contact us today to learn more.